The agreement would raise spending by $80 billion over two years, not including a $32 billion increase included in an emergency war fund. Those increases would be offset by cuts in spending on Medicare and Social Security disability benefits, as well as savings or revenue from an array of other programs, including selling oil from the nation’s strategic petroleum reserves. The Medicare savings would come from cuts in payments to doctors and other health care providers. The $80 billion increase amounts to little more than 1 percent per year of the nearly $4 trillion annual federal budget, but carries the politically charged significance of breaking through agreed-upon spending caps that Republicans had praised as a rare display of responsible cost-control and Democrats criticized as a wrongheaded drag on economic growth. Nonetheless, the deal would represent a major breakthrough after years of gridlock in Congress, especially on fiscal issues, as each side compromised on core issues. It frees Mr. Obama from budget battles as he looks to secure his legacy in the remainder of his second term, and gives clean starts to Mr. Ryan as speaker and to Republicans trying to persuade voters that they can be an effective governing majority. The publication also added that selling oil from the petroleum reserve is giving Capitol Hill “heartburn,” but the Medicare reforms are projected to save enrollees from a significant premium hike. Yet, it might be something that places Democrats in a bind, as some won’t vote for any deal that calls for cuts to entitlements. Moreover, it was negotiated that the auto-enrollment provision of Obamacare, which forced large employers to enroll their employees into health care programs, would be nixed, according to The Hill. A key piece of the budget deal – and one of its costliest provisions – staves off a 52-percent premium hike that would have hit 8 million Medicare Part B enrollees next year. That fix, which is the result of a glitch in federal benefits law, is estimated to cost nearly $8 billion. The deal would also prevent a 20 percent across-the-board cut in Social Security disability benefits for 11 million people next year, which was the result of a quickly drying-up trust fund. “We have extended the solvency of Social Security Disability Insurance and protected millions of seniors from a significant increase in their Medicare Part B premiums and deductibles next year,” House Minority Leader Nancy Pelosi (D-Calif.) wrote in a statement praising the deal Tuesday morning. But averting those increases will be offset by a series of changes to both the disability and Medicare programs – some of which could be tough for Democrats to stomach. Several of Pelosi’s top allies, including Democratic Caucus Chairman Xavier Becerra (Calif.), have made it clear over the last week that they would oppose any deal that decreased benefits. But one of the key pay-fors in the deal is the extension of the 2-percent cut in Medicare payments, which was first passed under the sequester. Of course, conservatives were not pleased with this process. The Hill added that when Boehner discussed that was going on with the budget deal during a closed-door meeting last night, conservatives balked at how this agreement was made. Rep. Justin Amash (R-MI) noted how this perfectly captures a broken Washington system. 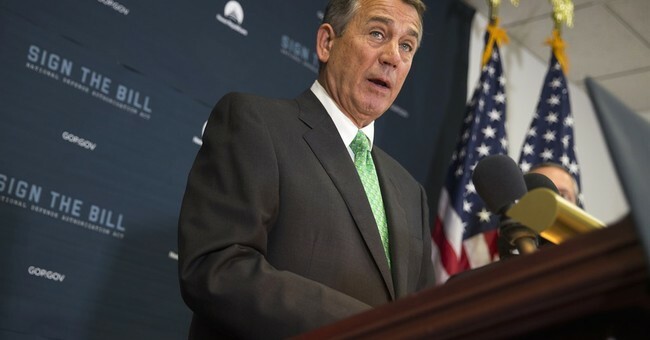 Boehner countered by saying Obama wants to bait Republicans into another shutdown. Roll Call also reported that House Freedom Caucus’s Rep. Raul Labrador wants a short-term debt deal in order for the House to come up with a long-term proposal, while Amash is probably going to vote against it in protest. “We’re all legislators…we’re supposed to be part of the process and if the outcome is more conservative or more liberal, so be it. But allow us to participate in the process and let the House determine the outcome through the votes,” he said. Nevertheless, there are probably enough votes for this deal to pass. This two-year budget agreement was filed last night. The House will vote on it tomorrow, so let me get into some of the details. This agreement will adjust the spending caps for two years by $80 billion, $50 billion the first year, and $30 billion in the second equally divided between defense and non-defense spending. All budget cap relief is fully offset with mandatory spending cuts and other savings. This agreement will bring greater certainty to next year’s appropriations process. What do those budget numbers mean exactly? Under this agreement, the discretionary budget number is $1.067 trillion for FY 16 and $1.070 trillion for FY 17. As Leader McCarthy said last night, those numbers are significantly below the discretionary budget numbers that most of you voted for as part of the 2011 Ryan budget. The discretionary budget number for this agreement is $56 billion below the Ryan budget for FY 16 and $70 billion below the Ryan budget for FY 17. Moreover, these budget numbers for FYs 16 and 17 are STILL BELOW the pre-sequester spending caps outlined in the 2011 Budget Control Act. The spending caps and other reductions remain on track to save taxpayers more than $2 trillion as mandated by the original Budget Control Act. This agreement includes significant long-term savings from structural entitlement reforms to the Social Security Disability Insurance (SSDI) program. Every worker in America pays a portion of their wages into Social Security, which is an essential part of the social safety net. By law, Social Security contributions are held in two trust funds – the Old-Age and Survivors Insurance (OASI) Trust Fund and the Disability Insurance (DI) Trust Fund. But next year – before the election – the Disability Insurance Trust Fund is expected to be unable to pay full benefits, resulting in a 20 percent across-the-board benefit cut unless Congress takes action. First, this agreement ensures that the Disability Insurance Trust Fund is able to continue to pay full benefits, preventing the benefit cut. Second, it includes structural entitlement reforms to strengthen the long-term solvency of both trust funds. Closing loopholes that allowed individuals to exploit Social Security’s rules in order to obtain larger benefits than Congress intended. Requiring a medical review before awarding benefits, which will crack down on fraud. Ensuring a robust demonstration program so that we can prove that work incentives increase program integrity. This is the first significant reform to Social Security since 1983, and would result in $168 billion long-term savings. The agreement includes significant savings from within the Medicare program. It extends the mandatory sequester through 2025, ensuring additional savings through mandatory entitlement programs. The bill also ensures taxpayers are not paying more for the same Medicare service provided in different locations. The combined Medicare reforms in this bill will provide over $30 billion in Medicare entitlement savings in the budget window. Taxpayers will also save billions of dollars outside of the budget window from permanent Medicare reforms that we secured. There are some other small savings within the agreement. The measure will provide a modest increase in fees that employers pay to the Pension Benefit Guaranty Corporation, similar to what we did in Ryan-Murray. Lastly, it prevents a spike in Medicare B premiums for millions of seniors. This initiative is fully offset. This measure would strengthen our national security, and would bring greater certainty to the Pentagon and our troops who are fighting in harm’s way. A two-year budget deal gives the Department of Defense certainty, which is its number one priority. This will allow, among other things, the department to plan and execute critical functions related to readiness of our military, including training, which is a key priority of mine, and I know for many of you. The deal also prioritizes putting the increased funding in the department’s base budget. This agreement also takes away the president’s ability to play political games with the defense number. The base defense discretionary number for FY 2016 is $548.1 billion. We will be $25 billion above the Budget Control Act number for FY 16 for base defense and $8 billion above the president’s defense OCO request. And while it’s $5 billion below our and the president’s original request, this is a binding agreement with the president and the Senate. So we’re stopping him from playing politics with troop funding – and giving the department certainty. To the point of several members in the room about trusting the president – this is why we negotiated a legislative floor for defense OCO that is the same in both FY16 and FY17. We were concerned the President might play games in the second year of the deal, and this provision was put in place to proactively head it off. This year we’ve made major strides in our work to defund and dismantle ObamaCare. We’ve activated reconciliation to put a bill to fundamentally dismantle the law on the President’s desk. And we’ve succeeded in forcing President Obama to sign our Hire More Heroes Act, and Brett Guthrie’s bill to protect millions of Americans from health care disruptions, and higher costs. This agreement builds on that success. By eliminating the law’s auto-enrollment mandate that forces workers to automatically enroll into employer-sponsored health care coverage that they may not want or need, we will repeal another major piece of ObamaCare. Lastly, this agreement would prevent a dangerous default that would threaten our economy, and raise the debt ceiling through March 2017. As you know, the administration kept moving up the date of default after claiming for months it wouldn’t hit until December. I’ve never seen anything quite like it in my entire career. This deal isn’t perfect by any means – but everyone should acknowledge what our alternative was. If we didn’t reach a bipartisan budget agreement, we would have been forced to accept another “clean” debt ceiling increase. Instead, we negotiated a plan that will also support our troops and deliver real entitlement reforms. In my view, this is the best possible deal at this moment for our troops, for taxpayers, and for the American people.